The largest throng to yet attend a ball game in Detroit overflowed Bennett Park. The players paraded to the park in carriages from the Russell House Hotel, and by the time they arrived, a mass of 10,0233 had overflowed into the outfield. The overflow necessitated the imposition of a ground rule— any balls into the outfield crowd would be doubles. After a band played a prophetic “There’ll be a Hot Time in the Old Town To-night,” Brewer leadoff hitter Irv Waldron hit a grounder to Kid Elberfeld at shortstop, who “made a gorgeous fumble.”6 Billy Gilbert followed with a base hit and Bill Hallman sacrificed both runners up a base. Tiger third baseman Jim “Doc” Casey then forced Waldron at the plate on John Anderson’s ground ball. Anderson and Gilbert attempted a double steal, but Elberfeld’s return throw to catcher Fred Buelow caught Gilbert for the third out. Casey led off for Detroit. Wearing the club’s new uniform, with a small red tiger on the cap, he accepted a basket of flowers from the Elks on arrival at the batter’s box. After he bowed in appreciation and handed off the flowers, he grounded back to the Milwaukee pitcher, Pink Hawley. The Tigers managed a hit and stolen base by Bill “Kid” Gleason, but didn’t score. Detroit managed to shut down the Brewers in the fourth, then scored their first run on an error, followed by Dillon’s ground rule double into the crowd. Elberfeld then knocked in Dillon with another ground rule double. The Tigers pecked away with a run in the fifth, and after six innings it was 7-3, Milwaukee. The Brewers, though, lengthened this to 10-3, plating three runs after two outs in the seventh. Duffy apparently considered the lead safe and replaced Hawley with Pete Dowling, a 24-year-old left-hander, who “had been Detroit’s jonah all last season.”9 Dowling held form through the Detroit seventh, allowing only a walk. Milwaukee padded its lead to 13-3 in the eighth, but the Tigers nicked Dowling for a run in their half, using another ground-rule double by Dillon. Still plugging away, Frisk got the Brewers one-two-three in the top of the ninth. With their team down 13 to 4 and the Tigers not having shown them much, some Detroit fans had left by the bottom of the inning. But there were still enough for overflow in the outfield, and Casey led off with another ground rule double. Jimmy Barrett beat out a slow grounder to third. Gleason then singled to center to score Casey. The crowd livened, as Holmes, Dillon, and Elberfeld all doubled. “The tremendous shouts that were sent up evidently unnerved Pitcher Dowling. As each hit went out a mighty cheer went up that was enough to make most any one lose his nerve.”10 Five runs were now in; it was 13-9. By this time Duffy was feeling uneasy. He came in from center field and replaced Dowling with Bert Husting. Husting, who wasn’t fully warmed up, uncorked a wild pitch, but settled down to retire Kid Nance for the first out. As the inning progressed, the crowd had pressed closer to the diamond. Duffy protested, and umpire Jack Sheridan ordered the fans back. The game was delayed a few minutes as the Detroit players “ran out to push back the throng in order to afford the Milwaukee outfielders a chance to chase some of the terrific drives that were being sent out.”11 Although the delay gave Husting a chance to warm up, he walked the next batter, Buelow. Frisk followed with a single to left, scoring Elberfeld. 13-10. Casey was next up and beat out a bunt down the third base line to load the bases. Husting was able to fan Barrett for the second out. Gleason then hit a hard shot to Burke at third base. But Burke botched the play and Buelow scored to make it 13-11. It quickly became 13-12 when Burke couldn’t get an out on Holmes’ slow roller and Frisk scored. Dillon was up again. The big first baseman already had three ground-rule doubles on the day, and made it a fourth when he ripped a 2-2 pitch into the crowd in left field. Casey and Gleason romped home with the tying and winning runs. And as of this writing in late 2015, the Tigers’ feat on their first day of play in the brand-new American League is still the biggest ninth inning game-winning comeback in major league baseball history. I would like to thank fellow SABR members Marc Okkonen and Jonathan Frankel (and any others whose emails I might have accidentally deleted) for help in obtaining material for this article. 1 Carl Bialik, “Baseball’s Biggest Ninth-Inning Comebacks,” Wall Street Journal, July 28, 2008; blogs.wsj.com; “Tigers’ Ten Greatest Games,” This Great Game: The Online Book of Baseball History, thisgreatgame.com. 3 Scott Ferkovich, “Bennett Park (Detroit),” SABR Baseball Biography Project, sabr.org. 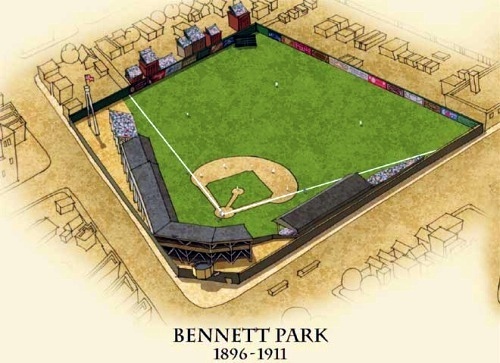 Bennett Park was built in 1896 with a capacity of 5,000. Seats were added for the 1901 season to bring capacity to 8,500. Ibid. 4 The 1900 Brewers finished second in the then-minor-circuit American League. Over the 1900-01 offseason, however, league president Ban Johnson pushed the AL to at least nominal parity with the “senior circuit” National League, which had held major league status since 1876. Brewer owner Henry Killilea was reluctant to spend the funds necessary to recruit National League players to Milwaukee; the team also lost 1900 manager Connie Mack to American League rival Philadelphia. With the game chronicled here typical of Milwaukee’s competitiveness, the club stumbled to a last-place, 48-89 finish in 1901. Johnson moved the franchise, which became the Browns, to St. Louis for 1902. Major league baseball didn’t return to Milwaukee until the arrival of the Braves from Boston for the 1953 season. Baseball-Reference.com; Donald Dewey and Nicholas Acocella, The Ball Clubs. New York: Harper Perennial, 1996, 307-08. 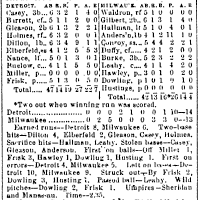 6 “Ten Runs Won in the Ninth,” Detroit Free Press, April 26, 1901. 7 “Ten Runs in Ninth,” Detroit Tribune, April 26, 1901, 1. 8 “Ten Runs . . .,” Detroit Free Press, April 26, 1901. 9 “Between the Innings,” Detroit Free Press, April 26, 1901. 10 “10,000 People See Great Batting Rally,” Detroit Free Press, April 26, 1901. 12 “Ten Runs in Ninth,” Detroit Tribune, April 26, 1901, 1. 13 “Base Ball As A Barometer Of Fans,” Detroit Tribune, April 26, 1901, 5. 14 “Thirteen A Hoodoo,” Evening Wisconsin, April 26, 1901.